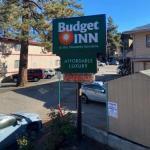 With easy access to the slopes free Wi-Fi and a daily complimentary breakfast the Stateline Economy Inn is an affordable choice in South Lake Tahoe. Exterior corridors lead to 32 rooms at the three-story Stateline Economy Inn. The simply decorated rooms available in smoking or non-smoking supply guests with free Wi-Fi and cable TV as well as microwaves and mini-fridges. After refueling with the complimentary continental breakfast take a dip in the seasonal outdoor pool in warmer months or head to the gondola across the street for skiing when the temperatures drop. Parking and local calls are free. Pets are allowed for an extra fee. Two miles from the center of South Lake Tahoe the Stateline Economy Inn sits across the street from the Heavenly Ski Resort's gondola. There are several restaurants and a cinema within walking distance. Within a half-mile guests can cross the Nevada State Line to try their luck at Harrah's Casino. In town you'll find more restaurants. Summer activities include the nearby public beach Bijou Golf Course two miles away and hiking along the Mt. Tallac Trail a half-hour drive from the motel. The closest major airport is Reno-Tahoe International Airport 56 miles north.